Ready or not, Google’s next big update arrives Tuesday, April 21, 2015. This date has loomed large in the minds of marketers and business leaders since Google first mentioned it earlier this year. It’s understandable that people are "freaking out" a little as similar fundamental changes to Google’s search algorithm have had a significant impact in the past. The words “penguin” and “panda” – folksy names given to Google’s big updates a few years ago – still elicit smirks, eye rolls and head shakes from those who had to scramble to convert website content and search engine optimization (SEO) strategy to the new order. The fact that Google hasn’t provided a lot of official information on their latest update (likely because they’re evolving it right up until its release), and that bloggers and forums regularly stoke the rumor mill with speculation on the change’s consequences doesn’t set anyone at ease, either. At least this time around, the name of the update gives us a clue about what to expect. So what is the “Mobile-Friendly Update” anyway? Starting April 21st, Google’s algorithm for search will privilege websites that are mobile-friendly. The changes will affect mobile search results only. The reason for this is straightforward. Like any business, Google has to serve their end customer – their customer is the searcher and their product is search results, or more specifically, the websites that comprise those search results. Given the rise of mobile usage and studies that show that mobile visitors are more likely to revisit mobile-friendly websites, Google recognizes their search needs to be optimized for mobile devices. This is why the update is happening now. 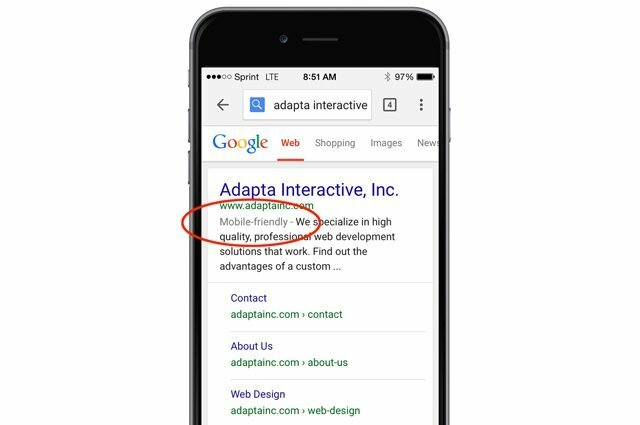 The “Mobile-friendly” designation will determine how you rank in mobile search results, i.e. if you have a mobile-friendly site, you will be ranked higher than a site that is not mobile-friendly. How do you know if you’re mobile-friendly? A defined viewing area that adjusts to the device’s screen size. Content that flows into view without the need to scroll horizontally or pinch the screen in order to see the entire page. Fonts that scale for easier reading on small screens. Easy-to-touch elements (e.g., buttons) that are well-spaced. Visual design and motion driven by mobile-friendly technology. Today, a mobile-friendly website is best achieved through a technique called Responsive Web Design which makes a website’s elements - navigation, text, images – “respond” to the user’s device by reorganizing them optimally for the size of the screen. A responsive website takes into account not just screen size (resolution) but also orientation (portrait and landscape view on tablets and smartphones). If you’re not sure if your website is responsive or if you meet Google’s mobile-friendly designation, you can use their free tool to find out in a matter of seconds. Go to this link and enter your website URL. Simply put, if your website isn’t mobile-friendly, you will start losing page rank in mobile search results. This is especially damaging if you rely on being “found” on Google for lead generation or other business goals (most of us do, even if we’re a non-profit organization). Decreased page rank equates to lost market share to competitors who have websites that are mobile-friendly as Google will rank them significantly higher than you in mobile search results. If my site is not mobile-friendly, will it disappear from search results? No, you will not disappear, your rank will just decrease. How much will mobile rankings be impacted? As of today, we don’t know exactly, however if your current page ranking is 1 or 2 in mobile search right now, you can expect it to decrease significantly. If my site is not mobile-friendly, will this impact my desktop rankings as well? No. Encouragingly, if you change to a mobile-friendly site after the update, you will likely see a double benefit from Google: 1) you will meet the mobile-friendly requirement; and 2) Your desktop page ranking will improve simply by having a new website that has been optimized for mobile (this has been true for awhile). As long as people rely on search engines to find information and Google continues to dominate the search market, you should care about your “Google score” a.k.a. how the search algorithm rates your website and shows it in search results. While that algorithm is arguably the best kept secret in the world and we will never understand it’s every variable and nuance, we can educate ourselves on the fundamental ways it works, allowing us to adapt and keep pace with the wider online marketplace. Bottom line: Mobile is here to stay. Google knows this and has acted accordingly, which means we must act accordingly to remain relevant and thrive.